IK Multimedia showed off a stereo/mono audio device for your iOS device that allows for cleaner audio in the iRig Mic Field. Perfect when capturing that song you love at a concert or even when capturing video of your kids playing outside. The iRig Mic Field connects to the lightning jack of your iOS device. 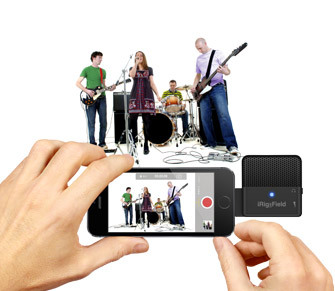 With the iRig Recorder, you can capture and edit your audio easily. Turn the Field to a landscape mode and record in stereo. Flip it the other way for a mono recording. The lighting plug allows for digital recording of up to 24-bit with a 44.1/48 kHz sampling rate. The mic contains two condenser capsules that have a 115 dB SPL rating and built in low-noise preamp. This will help keep the live recordings sounding a lot clearer than from your iOS microphone.